I’ve been debating what to name this sandwich since I made them last week. I am hoping that “Bistro” evokes an image of elevated flavors. 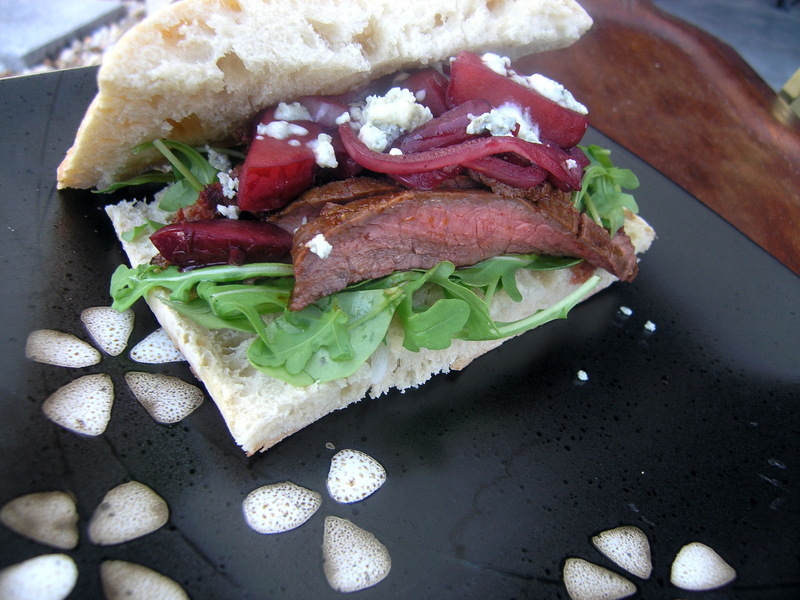 What I really want to convey is that this sandwich is the most awesome, flavortastic steak sandwich you’ll ever eat. If I were a sandwich, I may choose to be this sandwich… and I don’t even eat red meat all that often. So why all the ranting and raving? I think this sandwich compiles all of these fabulous and funky tastes into one bite, that when combined, are magical. First you start with a lightly toasted ciabatta roll. Add a bottom layer of spicy and peppery arugula, and a few slices of sirloin, and now we are starting something. The kicker here is the plum and onion red wine reduction; a tangy, sweet, and slightly sour mixture that not only stands out as an unusual flavor, but elevates the tastes around it. Finish with crumbled bleu cheese that adds an essential pungent aspect, and ladies and gentleman we have the perfect sandwich. Heat your grill on medium high, or to reach about 350 degrees. While the grill is preheating, start the wine reduction. Cut the onion into vertical quarters and then slice into thin, long slices. Remove the pits from the plums and cut into vertical quarters as well. Heat a small sauce pot on medium heat. Add the onions, plums, and 1 tbs olive oil. Saute for just a few minutes before adding the red wine. Bring the wine to a boil and then reduce to a very low simmer. Stir occasionally to prevent the bottom from sticking. Cook the reduction until the wine becomes a syrupy consistency and is almost completely absorbed by the onion and fruit. This can take up to 30 minutes. Remove from the heat when it reaches this texture and let it cool to room temperature. Season the steak well on both sides with salt, pepper, the garlic powder, and paprika. Grill the steak for 7 minutes per side, closing the grill in between. Remove the steak from the grill and let rest on a cookie sheet for at least 5 minutes . Slice the ciabatta through the middle to create a large top and bottom bun. Brush with 2 tbs of the olive oil and lightly season with salt and pepper. Grill the bun middle side down until it begins to brown, about 5-6 minutes. To assemble the sandwiches, put the ciabatta top and bottom on top of each other. Slice into four equal buns but cutting the longer side into four pieces. Toss the arugula with 1 tbs olive oil and 1 tbs balsamic. Divide among the four buns on the bottom. Slice the steak on the bias with a sharp meat-slicing knife into 1/2 inch pieces. Divide among the sandwiches. Top with wine and plum reduction and a heaping tbs of bleu cheese. The sandwiches can be served at room temperature or slightly warm and go well with a light salad.